Mango Season is about to end. The King fruit has huge varieties. In fact you can get varieties of mango recipes with this fruit. During the mango season, there is not a day when I don’t relish the goodness of this huge variety of mangoes. So, today I had tries to make a sweet dish sandesh with the natural flavour of Mango fruit slices. 1. Bring the milk to a boil in a thick bottomed pan. Add lemon juice into it and keep stir till milk curdled and water separated out. Turn off the heat and keep it aside for cooling. 2. Now stain the mixture by using a Muslin cloth and pass through it on cold running water. Press under a heavy object for 5 minutes till all water is drained and you could get the fresh paneer. 3. Take a bowl and add paneer and sugar into it. Mash it using your palm. 4. Heat a non stick pan or Kadai and add mango puree into it. Stir it for 2-3 minutes and add the paneer sugar mixture. Stir it on low medium heat for 3-4 minutes. Remove it from the heat and make it cool. Add some chopped cashew nuts into it and mix well. Stuffing Sandesh or Paneer is now ready. 5. Divide this mixture into 8-10 parts as per the mango slices you have. 6. 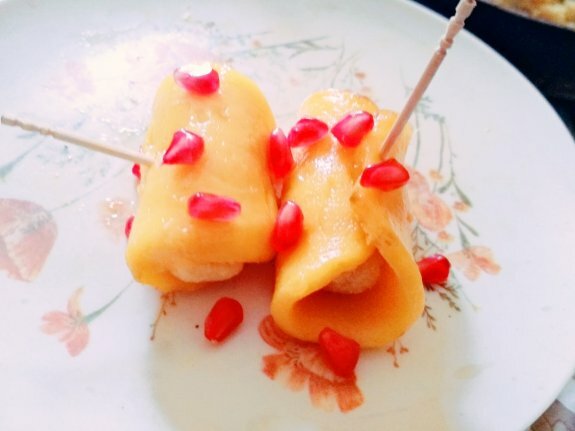 Place the each portion of the sandesh on each mango slice and roll it tightly. Lock it with toothpick. Place it on a serving dish. Do the same process with rest of all the mango slices and sandesh portions. 7. Decorate these with pomegranate seeds on top and serve it immediately.